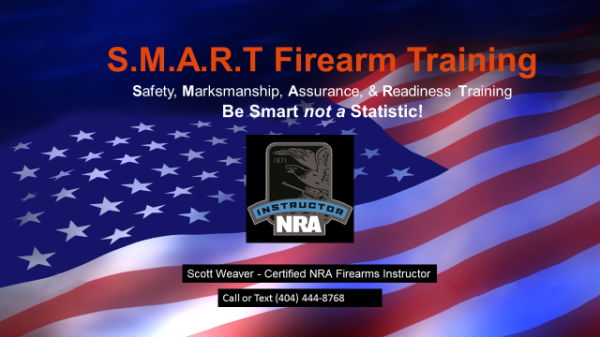 To schedule training at a time that is convenient for you please call or text (470) 265 -7895 . Families are Welcome! Private Classes are available for individuals, for your family, or your group. Classes are approximately 3-4 hours long. Costs: $ 75 per student if you use your gun and ammo. $125 if we furnish a gun and ammunition. Includes targets, range fees, use of our hearing and eye protection. We can provide handguns and ammunition at $125 per student. ($75 per student if you bring your own). Your gun (if you have one) You can use any of ours if you don't have one or want to try something different. Please click here to register, pay deposits or pay for the courses you're interested in. You can also mail deposits or payments. Please call for mailing address.